PORTSMOUTH - Good things began happening for Trevor Salema when he enrolled at Great Bay Community College. First, the school added a sports management track in its business curriculum, enabling Salema to pursue a career that combines his interest in business with his interest in sports. At the same time, the school added baseball to its sports offerings, which allows Salema to play baseball at the college level while earning credits toward his degree. Salema, an 18-year-old from Kittery, will graduate next spring with an associate degree in Business Administration. 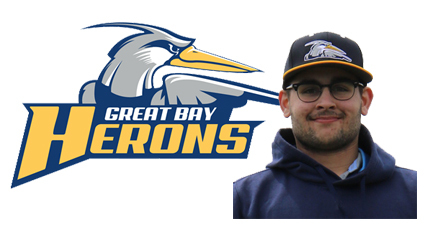 He is among the first students enrolled in Great Bay’s new 21-credit sports management elective, which began in fall 2017. The curriculum includes courses in facilities management, sports and recreation tourism, sports law, sports in society and an internship component. As part of his studies, Salema is interning this semester with Seacoast United, which operates sports clubs and facilities across the region. He plans to turn this experience into an internship where he will not only gain experience, but also college credit while learning the ins and outs of running multi-sport indoor and outdoor facilities. At GBCC, students who take the 3-credit Business Internship course have the opportunity to pair up the work experience with coursework. Great Bay also means Salema can keep playing ball. Baseball is his passion and playing for the college team instills pride and accomplishment, he said. “We have a real tight-knit group of kids on the team. We’re all really close. They’re good kids and good people. It’s fun to be around all of them. It’s like we are one big family now,” said Salema, a pitcher. His Seacoast United internship both completes and extends his sporting circle. Salema’s early baseball experiences occurred with Seacoast United teams. As he looks toward a career in sports management, Seacoast United represents the kind of work he might pursue. His associate degree will prepare him to begin his career right away or allow him to transfer to a four-year school. As part of his internship, he is learning how large indoor sports facilities work, gaining understanding of the complexities of managing multiple leagues in multiple sports, and digesting the many layers of a business operation that caters to different levels of competitors and clients. Story provided courtesy of Great Bay Community College.